Two Bed Deionization system:In this type of design, complete deionization is achieved. The system that would be recommended consists of strongly acidification exchange unit, followed by strongly basic anion exchange unit. As far as regenerants are concerned, we could use hydrochloric or sulphuric acid for the cation exchange resin, and in the case of strongly basic anion exchange resin, sodium hydroxide could be used. Acerage conductivity to purified water less than one micro siemens/cm2(after mixed bed unit). Message display for continuous readout of system status on request. Minimum installation and commissioning costs. Treated water quality :pH> 7.5-9.5, Conductivity <30 micro-siemens/cm2. 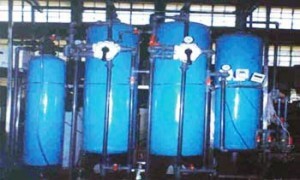 Acid & Alkali solution tanks provided.